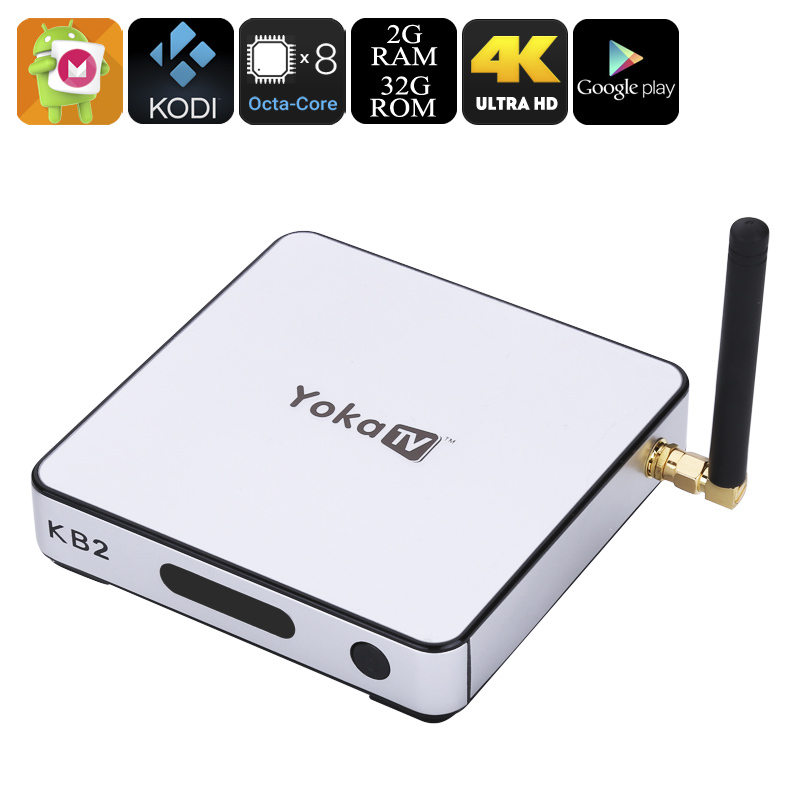 Successfully Added Yoka TV KB2 Amlogic S912 TV Box - Android 6.0, 4K, Google Play, Kodi 17.0, Octa-Core CPU, Mali-T820MP3 GPU to your Shopping Cart. Bring hours of joy into your household with the Yoka TV KB2 Amlogic S912 TV Box. Featuring an Android 6.0 operating system this TV box can be used for a whole lot more than simply watching movies. With Google Play and Kodi 17.0 installed the Yoka TV KB2 Amlogic S912 TV Box grants you access to millions of Apps and days worth of multi-media – providing you with countless hours of fun and entertainment that won’t cost you a single dime. On today’s market there are countless TV boxes to be found yet not many will enhance your user experience as much as the Yoka TV KB2 Amlogic S912 TV Box. Featuring a powerful Octa-Core CPU, Mali T820 GPU, and 2GB of RAM this Android TV box is capable of playing the latest and most demanding 4K movies, games, Apps, and a whole lot more. With its 32GB or internal storage space and additional 32GB of external storage space the Yoka TV KB2 Amlogic S912 TV Box offers a perfect platform on which to enjoy countless hours of your favorite media. The ability to play ultra-HD movies in 4K resolution gives you the possibility to turn your cozy living room into your own private movie theater. Invite your friends over for a casual movie night or simply enjoy an evening at home with the family, this Android 6.0 TV box will provide you and your loved ones with countless hours of joy to come. Featuring Dual-Band Wi-Fi this TV box offers the fastest data connectivity out there. Download the latest Apps and movies through Google Play and Kodi TV in the blink of an eye or endlessly stream your favorite series from the internet without experiencing any lag– with its ultra-fast connection the Yoka TV KB2 Amlogic S912 TV Box is guaranteed to enhance your user experience to the absolute most. Its stylish silver design features a cool Blue lighted up logo that gives this Android TV Box a neat look, making this a perfect little gadget to increase your living room’s ambiance by making it more lively and futuristic. The Yoka TV KB2 Amlogic S912 TV Box comes with a 12 months warranty, brought to you by the leader in Android TV Boxes as well as wholesale electronic gadgets..
Arabic: - الروبوت مربع التلفزيون 6.0 - Chinese Simplified: - 安卓 6.0 电视盒 - Czech: - Android 6.0 TV Box - Dutch: - Android 6.0 TV-kast - French: - 6.0 Android TV Box - German: - Android TV-Box 6.0 - Hebrew: - אנדרואיד תיבת טלוויזיה 6.0 - Hindi: - एंड्रॉयड 6.0 टी वी बॉक्स - Hungarian: - 6.0 Android TV Box - Italian: - Android TV-Box 6.0 - Japanese: - アンドロイド 6.0 テレビ ボックス - Korean: - 안 드 로이드 6.0 TV 상자 - Malay: - Peti TV 6.0 Android - Norwegian Bokmål: - Android 6.0 TV boks - Romanian: - Android 6.0 TV Box - Russian: - 6.0 андроид TV Box - Spanish: - 6.0 Android TV Box - Thai: - หุ่นยนต์กล่องทีวี 6.0 - Turkish: - Android 6.0 TV kutusu - Vietnamese: - Android 6.0 TV Box. Received the Yoka TV in good condition and superb delivery suing UPS!! Good job Chinavasion..keep it up!